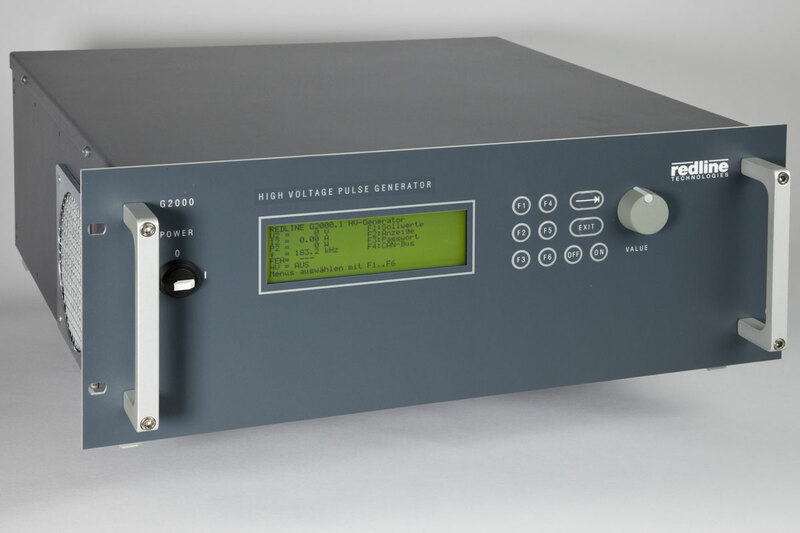 This is our G2000 high voltage / medium frequency generator for creating plasma or discharge at normal atmospheric pressure – with full manual or remote control of all parameters. Its job is to generate plasma at normal atmospheric pressure. You need no vacuum, no liquid. This means easy integration into a production line, with no waste material. The applications are numerous: Plasma desinfects, sterilisates, cleans, degreases, improves and conditions surfaces, enforces chemical reactions, passivates, oxidates. The G2000 uses the resonant tank characteristics of transformer / cable / load to operate with (quasi-)sinewave waveshapes. This means very efficient, power-saving operation as well as low electromagnetic interference. Of course it is short-circuit and open-circuit proof. The high voltage transformer is air-insulated for service-free operation. It has no oil-filled transformer, thus it is usable in cleanrooms. With the G2000 you are not limited to a preconfigured point of operation. Instead you have full manual or remote control of all parameters via the front panel menu or the CAN bus interface. You can tune the G2000 through an extraordinary wide frequency range. It provides built-in pulse-packet modulation for reducing power without varying voltage or frequency. The G2000 is used wordwide in many research facilites and production lines. It is beloved for its fully flexible setting of all parameters. Join the successful users! It comes with some voltage and power options. You also have the choice between internal transformer or separate external transformer. See the datasheet for all variants. We also supply the accessories you need, such as high-voltage cables for long-term operation.